Eskom’s controversial tender to replace six steam generators at Koeberg is once again under the spotlight following Constitutional Court arguments on the issue. By AIMEE CLARKE for EE PUBLISHERS. For the third time since awarding a R5-billion tender to Areva in 12 August 2014, Eskom found itself defending its award decision – this time in the highest court of the land. While Eskom and Areva appealed to the Constitutional Court (ConCourt) that the award of the contract for the replacement of six steam generators at Koeberg power station was both lawful and indeed essential for nuclear safety, losing bidder Westinghouse Belgium maintained that it should be substituted as the successful bidder in place of Areva. On 9 December 2015, a Supreme Court of Appeal (SCA) judgement had ruled that Eskom’s procurement process and contract award was unlawful and in breach of the Promotion of Administrative Justice Act (PAJA), which requires that the procurement processes of organs of state (such as Eskom) must be fair, open, transparent and competitive. What was unfair about it? In a nutshell – according to Westinghouse and accepted by the SCA – Eskom had changed the rules of the game at half-time (see background article here). In making its decision to award the tender to Areva, Eskom had taken into account various additional so-called “strategic considerations”, which were not explicitly stated in the original bid award criteria. Initially Eskom had deemed both Westinghouse’s technical and commercial offerings to be on a par with that of Areva, but with Westinghouse’s offering having a lower cost. However, after taking into account the new “strategic considerations” not stated in the tender documents, Eskom subsequently deemed Areva to have a superior quality offering, with a three-month safety margin (or “float”) in its construction schedule. Westinghouse opposed the contract award, first unsuccessfully in the High Court, and then successfully at the SCA, which ruled that the contract be set aside and sent back to Eskom to start the procurement process again from scratch – but this time lawfully. The SCA judgement stated that an Eskom tender must “speak for itself” – bashing Eskom’s and Areva’s claims that the strategic considerations were “implied” in the tender document. Neither Eskom, Areva nor Westinghouse were satisfied with the outcome of the SCA judgement, and all three parties applied to the ConCourt for leave to appeal (see background article here). Why is any of this a constitutional matter? Eskom and Areva argue that the dispute is a matter of “national importance” involving issues of public safety and procurement using public money. Westinghouse says it is because Eskom did not comply with the requirements of PAJA, an act of parliament established in terms of the Constitution of South Africa. On 18 May 2016 Eskom and Areva argued before the ConCourt that the strategic considerations not included in the original bid award criteria were reasonably implied, and that Eskom had the right to make a “value decision” in the interest of the public. Westinghouse argued that Eskom was not entitled to take these new considerations into account, and that Westinghouse should be substituted for Areva as the successful tenderer. In its affidavit to the ConCourt, Eskom states that Westinghouse has admitted it cannot now meet the 2018 X23 reactor shutdown deadline for the installation of the steam generators, “thus there is no need to go back and start the tender process afresh”. Eskom opposed Westinghouse’s plea for substitution, stating that it “is not a forgone conclusion that Westinghouse will be awarded the tender because Eskom is entitled to consider strategic considerations”. The affidavit further argues that if Eskom is ordered to commence the tender process afresh, it will end up contracting at a higher price and completing the work at a much later date than for the current contract. Eskom states time and again that Areva is able to meet the X23 reactor shutdown deadline. However, in the affidavit, Eskom states that to “improve project planning”, the time between the X22 and X23 outages will be changed from 15 months to 24 months, thus moving the X23 outage “to a later date, thereby accommodating a later delivery of the steam generators” by Areva. Effectively, Eskom has now shifted the goalposts in addition to changing the rules of the game. With so many changes in its favour, surely Areva will now be able to score? Perhaps not. Eskom’s affidavit to the ConCourt admits that Areva is now running late as a result of various widely reported manufacturing and quality issues at Areva’s forging facility, and will in fact not meet the much vaunted X23 outage as originally planned after all, notwithstanding the claimed 3-month float and extending the X23 shutdown date by nine months. In addition there have been other widely reported quality lapses relating to defective Areva-made nuclear power plant components dating back decades. Eskom and Areva have both agreed (according to Eskom’s affidavit) to work on their own “mitigation plan” to avoid further schedule slippage, including “revised production planning to accommodate later delivery”, providing the option to install the Areva steam generators during the next (X24) refuelling and maintenance outage in 2021/22. The mitigation plan also includes actions such as improving Eskom’s project management, introducing parallel manufacturing and development plans to optimise time, and analysing Areva’s manufacturing quality issues at its forging facility (where Areva has admitted that some of its manufacturing and quality control reports may have been falsified). Eskom accepts however that these actions “may not necessarily result in reduced time” but will reduce further slippage to ensure that Areva will be able to meet the anticipated milestones. Perhaps Areva will meet the revised milestones, but do we really want to have this project ending up as a rushed job of questionable quality? Westinghouse on the other hand argues that if it is substituted as the successful contractor, it will be in a position to effect the steam generator installation at the X25 reactor shutdown in 2025, and that this will not impact on safety and quality. Unsurprisingly, Eskom rejects this claim, indicating that there is an unacceptable increased risk to both safely and security of supply if the steam generators were only to be installed in 2025. 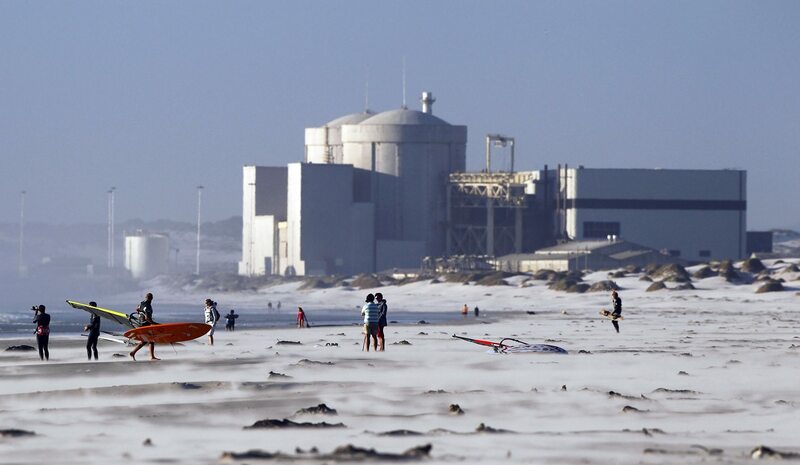 While Westinghouse labelled this as “alarmist” before the ConCourt, Eskom accused Westinghouse of having a “cavalier attitude toward nuclear safety”, despite the fact that Eskom’s own Koeberg maintenance reports state that the steam generators are in good condition to operate until 2025. In a more down-to-earth argument, Eskom says that with the weakening South African rand against the US dollar, Westinghouse’s price would now be significantly higher than that of Areva. Based on an Eskom financial risk analysis, the utility’s heads-of-argument to the ConCourt says that “Westinghouse will be over R1-billion more expensive than it was when it tendered in 2014”, and that the cost of the substitution in its entirety would be around R3,2-billion. After sitting on 18 May 2016, the ConCourt reserved its judgement, and we are now awaiting its final decision on all the issues heard. For now, therefore, we can only speculate on the outcome. Chris Yelland, EE Publisher’s investigative editor, believes that the ConCourt is unlikely to interfere with the majority decision of the SCA, and will uphold the SCA judgement declaring the contract award unfair, procedurally irregular and therefor invalid and unlawful. But the question remains: What remedies will the ConCourt order? The ConCourt may uphold the SCA remedy that the contract with Areva be “set aside” and the matter “remitted to Eskom for reconsideration in terms of the Promotion of Administrative Justice Act”. The ConCourt may overrule the above remedy ordered by the SCA, and uphold Westinghouse’s appeal to the ConCourt to be substituted as the successful tenderer in place of Areva. The ConCourt may decide that although the contract with Areva was irregular and invalid, as found by the SCA, the national and public interest in respect of nuclear safety, security of electricity supply and cost may be such that the egg “cannot be unscrambled” at this stage, and that the contract with Areva may therefore proceed. Chris Yelland believes that the remedy of substitution of Westinghouse as the successful tenderer by the ConCourt is an unusual remedy, and therefor unlikely. He also feels that the ConCourt will be reluctant to impose the contract award to Westinghouse over the heads of Eskom for a contract of such technical and commercial complexity and risk. Furthermore, Eskom has already made it clear that if the tender process is restarted from scratch again, it would simply award the tender to Areva again, and the only difference in the result would be a delay in the project execution, with additional costs and nuclear safety risks to both Eskom and the public resulting from the delay. Considering these points, it is perhaps most likely that despite the irregularities in the tender process, the ConCourt will rule that the contract with Areva be allowed to proceed. Aimee Clarke is an assistant editor at EE Publishers.